Hi there. I hope things aren't too hectic at your house, getting ready to cook for five or ten or thirty. Ironically, Thanksgiving week is probably the week we do the least cooking here; we don't host, and the cousins that do host are so organized that they pack everyone home with a mountain of leftovers in tupperware. We spend the days afterward enjoying the glory that is The Mashed Potato-Cranberry Sauce-Gravy-Turkey sandwich. I'm looking forward to it. In the meantime, though, in the lead up, we've been cooking more the past few days than we have in months. We took a trip to transition from the busy season to the off season, a trip that involved an absolutely worth it but bankrupting amount of eating out, and when we got back I found myself with an overwhelming desire to cook and eat in my own kitchen. I spent the better part of Sunday afternoon making sandwich bread and yogurt and Alice Water's excellent spinach lasagna, and finally a loaf of lemon poppyseed bread. Saturday we tried my friend Sarah's seared halibut with coriander and carrots, only with local haddock instead. Friday I made a bean soup from Nina Planck's excellent Real Food Cookbook, a very plain bean soup I didn't entirely expect to like, but that everyone in our house deemed excellent. Tonight if all goes according to plan we'll be having a seafood stew from Jerusalem. It feels good. In other highlights, this weekend marks the official start of eggnog season. We'll be kicking it off with a nine-dozen-egg batch of Colonel Miles Cary's eggnog. The Pilgrims starts tonight on PBS, and National Geographic's take, Saints & Strangers, encores Thanksgiving night. From the New York Times: choose to be thankful; it will make you happy. With Black Friday on the horizon, food for thought. The Orleans Winter Farmers Market starts up December 5th and will run every first and third Saturday of the month through April at the middle school from nine to noon. A big part of eating locally is being flexible when it comes to ingredients; the market didn't have spinach, but it did have Swiss chard. Here's a riff on Alice Water's original spinach lasagna from The Art of Simple Food. I've found so long as you keep the basic proportions the same, you can use just about any veggie. Preheat the oven to 400 degrees F and bring a large pot of salted water to the boil. Meanwhile, start the béchamel. Melt the butter in a medium pot over medium heat. Add the flour and whisk until thick, then cook another minute or two, whisking often, until just slightly golden. Add a small splash of milk; whisk until the sauce thickens and is free of lumps. Continue adding the milk, splash by splash, until the whole two cups have been absorbed into a smooth sauce. Turn the heat down to low, season with salt and pepper, and simmer, stirring often, until you're ready to put the lasagna together. Do not let the sauce cool or it will harden and thicken. Add the lasagna noodles to the boiling water and cook according to package instructions. Warm up a splash of olive oil in a large skillet over medium-low heat. Add the garlic, and cook for about thirty seconds, or until fragrant. Add the mushrooms and cook, stirring often, until they give up their juices. 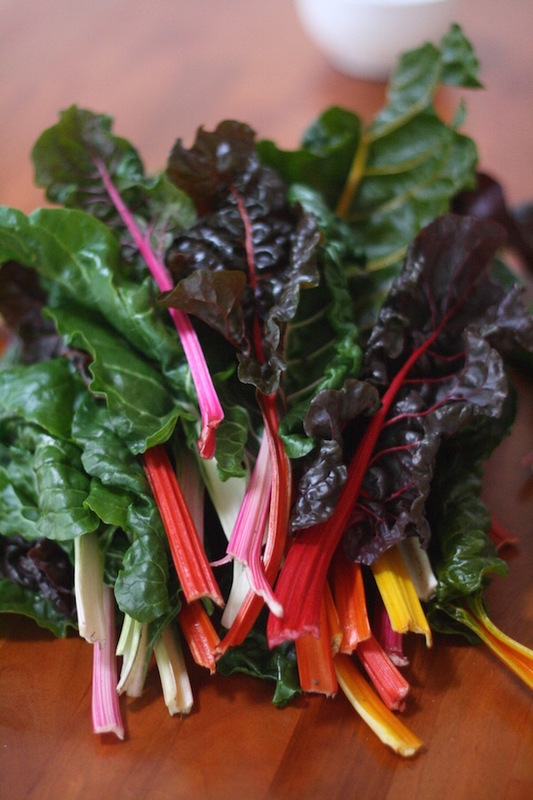 Stir in the Swiss chard, season with salt to taste, cover the pan, and cook for another 5-8 minutes, until wilted. Turn off the heat and set the pan aside. Mix the ricotta with 1 tablespoon olive oil and salt to taste. Stir half of the Parmesan into the béchamel. Drain the pasta and immediately run under cold water to help prevent sticking. Now assemble the lasagna. Grease a 9 by 13 inch casserole dish. Cover the bottom with a layer of noodles. Next use about 1/3 of the ricotta and tomato sauce to make the next layer, followed by a layer of noodles and a layer of the mushroom and spinach mixture and the béchamel. Continue layering, finishing with a layer of noodles topped with tomato sauce, sliced mozzarella, and a sprinkle of the remaining Parmesan. Bake for 25-30 minutes, or until golden on top and bubbly throughout. Let the lasagna rest for at least 5 and preferable 20-30 minutes. Serve warm.